Quotes of GOLD continue to move in the framework of the fall and the formation of the «Triangle» model. At the time of the publication of the forecast, the price of GOLD is 1286 Dollars per Troy Oz. At the moment, we should expect an attempt to rise and test the resistance level near the area of ​​1295. Where should we expect a rebound and the continuation of the fall in the price of GOLD with a target below the level of 1250. In favor of reducing the XAUUSD quotes, a test of the trend line on the relative strength index (RSI) will be made. The second signal will be a rebound from the upper limit of the model «Triangle». Cancellation of the option of falling gold prices will be a strong growth and a breakdown of 1310. This will indicate a breakdown of the upper limit of the «Triangle» model and continued growth to the area above the level of 1345. Wait for the XAU/USD price drop to accelerate with the breakdown of the lower boundary of the «Triangle» model and closing below level 1275. 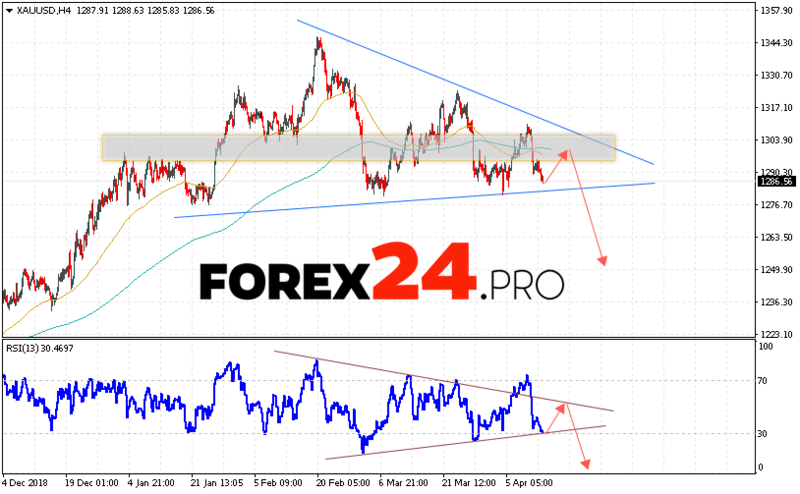 XAU/USD Forecast and GOLD analysis April 16, 2019 implies an attempt to test the resistance area near the level of 1295. Further, the continuation of the fall in quotations with a goal below the level of 1250. Cancellation of the option of falling gold prices will be a strong increase and a breakdown of the level of 1310, on the breakdown of the upper boundary of the model «Triangle». In this case, it is worth expecting the continuation of the rise of Gold above the level of 1345.